The Kel-Tec SUB-2000 is a folding, semi-automatic, pistol caliber carbine (PCC). Back in 2012, I did a review of the 1st generation of the Kel-Tec SUB-2000 PCC. With a slimmer forend that comes with rails on the top and bottom, generation 2 of the Sub-2000 is a handier, more flexible firearm. The enlarged ejection port should also help with reliability. The biggest feature of the SUB-2000 is it’s ability to fold. It’s simply fantastic: it’s easy to use, folds the rifle almost exactly in half, and is fast to deploy. It’s very easy to toss into a small gun case or haul around. Because the folding makes it exactly as long as the barrel, the American one folds to 16.25″ while the Canadian one folds to 18.5″. When folded, it’s locked together by a latching tab at the top of the buttstock. When in firing mode, the trigger guard can be pulled down to unlock and fold the gun again. The second feature that I love is that it comes in many models compatible with many popular handgun magazines. You can buy a SUB-2000 that matches your pistol mags so you don’t have to buy more. The Glock versions are really popular in Canada and with inexpensive PMags, they’re likely the most economical. The Gen2 SUB-2000’s have a forend with rails on top and on bottom. If you want to run an optic and retain the folding and locking capability, you’ll have to use a quick detachable mount or run a 45 degree offset offset mount. If you want to run a flashlight or grip on the bottom, you’re able to. 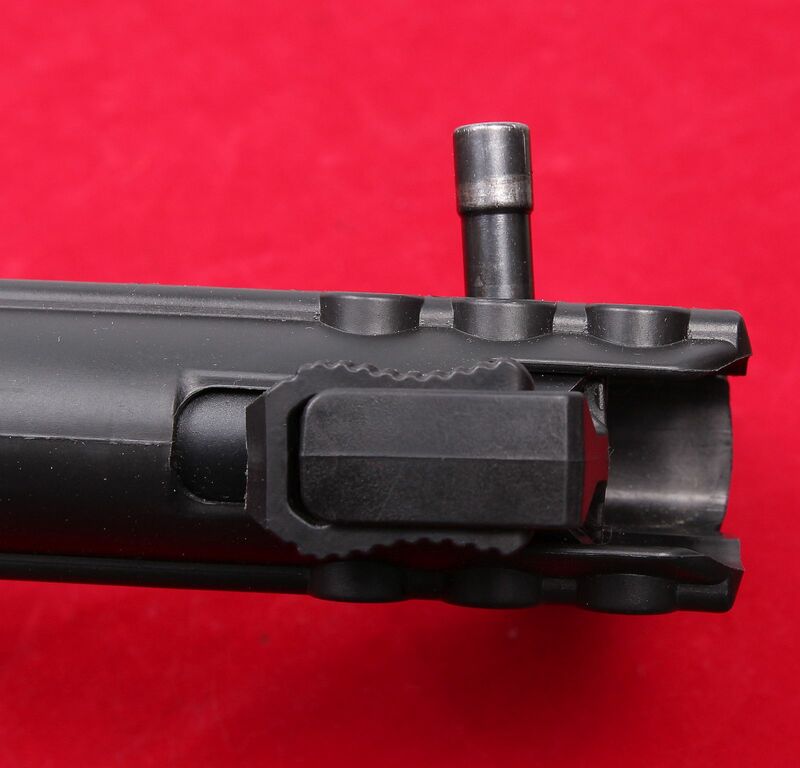 There’s also M-LOK slots on the sides if you want to pop something there such as a sling mount or flashlight activator. There are some excellent parts of usability in the SUB-2000, and some less than stellar points. The folding mechanism is simply excellent. Much of the actual shootability of the rifle is somewhat compromised. Trigger pull from the factory is a heavy 9lbs. Aftermarket supplier M*Carbo has a kit that brings it down to 5.25lbs. Effort to pull the charging handle is high. It’s a pretty stout recoil spring, and needs quite a bit of muscle to pull it back. It’s also a bit awkward to get a good handle on since it’s underneath the receiver tube. The magazine release is a bit small. Still usable, just smaller than it needs to be. The cross bolt safety was super stiff on mine and very loud to actuate. The grip is a bit short. Extensions on your mags will help. Disassembly is very easy. Check out the video review for a better idea of steps and difficulty. The great majority of SUB-2000’s don’t get used for hunting, but this one went out rabbit hunting. The light weight of the Kel-Tec makes it really easy to handle and tromp around in the woods with. The center balance point is right at the trigger guard, so you can carry it by that part if you wish. I did not attempt to carry it with a sling, as I thought it was light enough for even extended hikes. I really like QD-slings that connect to the left side of the rifle, so if I were to run a sling I’d probably get an M-LOC QD mount for the left side of the forend and epoxy a QD cup on the buttstock. This thing is made for plinking! It’s super easy to haul out to a gravel pit with a few mags and a bunch of 9mm and plink rocks or cans with. Inexpensive ammo, inexpensive and compact gun, it’s a great combination. Muzzle blast is super tame, recoil is fine, and accuracy is OK. The cheap and cheerful peep sight offers room to see what you’re aiming at. The SUB-2000 is not the ultimate PCC. It’s a tradeoff to get compactness and price to a target point. Personally, I think the JR Carbine is a better shooter made from nicer materials and is more flexible. It also costs quite a bit more than a SUB-2000 and can’t fold down. The Aero Survival Rifle can be taken down for travel (although is slower to do so) and is made of nicer materials, but it’s a bit more in cost and has goofier ergonomics than the SUB-2000 (odd magazine release placement, no forend, etc). There aren’t really comparable products at the price point the SUB 2000 is at, so it makes it difficult to compare it to others. The inexpensive price and inexpensive materials aren’t really used by other manufacturers and turn off some shooters. But, if you’re looking for an inexpensive, folding PCC, your only real option is the Kel-Tec SUB-2000.